Primitive Fall Autumn Halloween Candy Corn Rusty Tin Hanging Pocket with Berries. A fall staple....It's always the start to the fall season when you start seeing these and caramel apples show up in store isles. 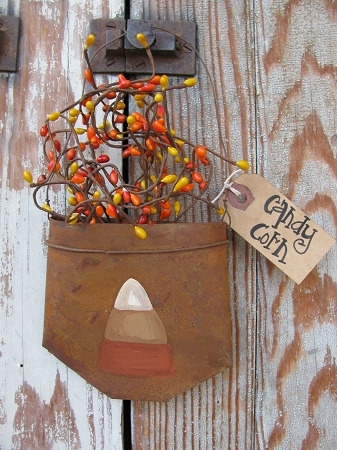 I've taken our popular rusty tin hanging pocket, painted a primitive candy corn on it and filled it with primitive pip berries that coordinate nicely. A primitive tea stained tag is attached to the side, which you can choose your favorite saying to be written on. Then you're all set for fall decorating. Size is 4"x4". Hand painted and designed by Heidi.